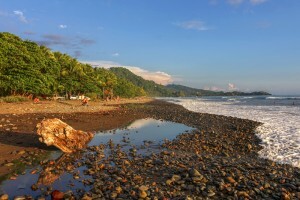 Dominical, Uvita, and Ojochal, are located in Costa Rica’s southern Pacific coast. This trio of beach towns has become a surfing haven and a place where expats feel right at home. The tropical climate and dramatic landscapes that slope into the sea are one of several reasons that people are drawn to living in Costa Rica. There is little beach development here due to a large national park with protected areas that have been restricted from all development. This has created a pristine paradise that has not experienced over-development that other portions of Costa Rica has seen. The views are simply outstanding! In the last decade HUGE improvements have been made to provide ease of access to these towns including a new, wide, access road that was built in recent years. Costa Rica real estate investors and retirees coming to these areas are happy to find a welcoming community of expats and retirees filled with lots of social events and social opportunities. Ojochal is a mecca for gourmet minded expats searching for culinary delights. Click to see Ojochal Homes for Sale. There are several restaurant options with a wide array of cuisine options. The area has become widely known for this and there are several culinary festivals that take place here each year. Retirees do not desire to spend all of their retirement and life’s savings on a tropical location that breaks that bank. They are always pleased to find out that Costa Rica real estate offers tropical settings and beach views at a fraction of the cost stateside and in other well-known areas in Europe. We are a full service Costa Rica real estate firm helping first time buyers of Costa Rica property as well as seasoned investors. We can help you locate homes for sale, Costa Rica condos, villas, retreats as well as Costa Rica ranches and large tracts of use-able farm lands for sale.